I’ve been asked by the Grenville Historical Society to do my Home Children presentation next month… ah… to be loved and wanted. And best of all, speaking in front of folks will make me better prepared for book launches, readings and giving workshops. Yowzers! If my Dad could only see me now, but somehow I think he can. I made enough handouts for 30 people (I heard somewhere that people like them), in addition to the master one I kept for myself to read from throughout the evening… the indenture form, my father’s “form of admission” and “visitation records”. There was a huge crowd in attendance. Far more than the 30 I had expected My best guess would be upwards of 60 and maybe as many as 75. A number of visitors came because I was doing a talk on home children and they had home children in their ancestry. Others came because they had an interest in the subject. Folks came from Kingston, Perth and Ottawa just to see/hear “littl e old me”. I’d like to say that for the hour I spoke and took questions from the floor, I had the audience eating out of my hands but I don’t think I was that good. Still, my presentation was well-received. And best of all, I wasn’t nervous! I suppose it helped that I knew some of the folks from the genealogical society who were there, and a neighbour from when I was a little girl came, too. I had a chance to speak to him afterwards and he told me he didn’t recognize me at first, then I mentioned my father was a Home Child and he put two and two together and realized who I was. Afterwards, it was great to speak to the folks who came up to ask me questions on a more personal (one on one) basis, or just chat. My performance was recorded on video DVD so I’ll work on getting it up on my website or here on my blog. On Monday night, I’ll be doing a presentation to our local genealogical society on Home Children. I was asked back in the spring if I would do it and I agreed. I even made one of the local free newspapers (although I don’t get this particular one). I happened to flip through it when I was visiting my mum in hospital and saw it. I must check one of the other ones that I do get so I can keep anything about my presentation that’s in it, too. So pitching to an agent tomorrow morning, doing a presentation Monday night. I’m going to be a busy girl. Hope I can live up to everyone’s expectations. It was an evening at Library and Archives Canada in Ottawa shared with many people with a common bond. Somewhere in their ancestry was a British Home Child. For some, it was a recent ancestor – a mother or father (in my case my father) – but many were further back in the family tree. MP Phil McColeman who performed the opening and closing ceremonies – his uncle was a Home Child. The keynote speaker, Senator Gerry St Germain, had a Home Child in his family tree, too. In his case it was his maternal grandfather. 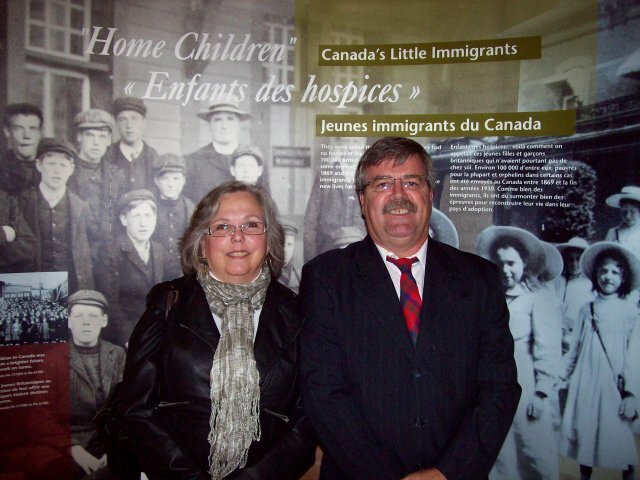 After Senator St Germain spoke, the postage stamp commemorating Home Children was unveiled by Douglas Jones, Senior VP of Operations at Canada Post. And guess what? He had a Home Child in his family, as well. The film Childhood Lost: The Story of Canada’s Home Children was screened by the roughly 200 attendees. What an emotional roller coaster that was to watch. I felt myself get weepy many times throughout the viewing. We even had a Home Child in attendance – Syd Baker (who identified himself as such) anyway when Phil McColeman finished his closing remarks, Syd took over the microphone very briefly. He said his was a very long, long story but he did reveal he grew up at Barnardo’s. He didn’t come with a party of children but later in life as a married man and it wasn’t until he was in his 60s that he found his siblings. Afterwards, it was a chance to mingle with the attendees and meet up with old friends, visit with other family members before finally calling it an evening. This is my husband and me posing in front of the large storyboard set up outside the auditorium where the ceremony and film screening took place. On the floor behind us encased in a clear, protective Lexan cube was a Home Child’s trunk along with a small Bible on its lid. We scrub up pretty good… at least I think so. Tonight I’ll be attending the reception to launch The Year of the British Home Child in Ottawa. Since my father was one of the 100,000 sent out from the British Isle between 1869 and 1938, I wouldn’t miss this for the world. I fleshed out another bothersome transition yesterday. Reads much better now (at least I think it does). Will have to send it off to my critique partner for her input since she was the one who first thought this one was too abrupt. After getting that fixed, I did get some other writing done but not as much as I’d hoped. Maybe a bit later today, I’ll be able to get on a roll and get something accomplished. Since Monday, I’ve not done a lot of “new” writing. I fixed a transition in the piece I worked on last week. Contemplated fleshing another area out some more but have decided I’ll leave it for now. And while I was in “fixing” mode, I went back and rounded up the plot bunnies that threatened to run amok because of a change I made later on in the book. Might as well get it done while I was thinking about it.